CM: What were some of the highlights for Advance Professional in 2018? We phased in the technology for cross-banner visibility first with our store systems and then through our B2B platforms, AdvancePro and speedDial. Our team members’ engagement in this project produced very positive responses from our customers and contributed to driving market-share gains. Secondly, we introduced MyAdvance, enabling our customers to have complete access to our professional programs and products from a single portal. MyAdvance consolidated more than 30 different portals and includes access to AdvancePro, our B2B platform, CTI training, eServices, product offers and other information they need to run their business. Customers also can check product availability, place orders and manage multiple aspects of their business through a single portal. 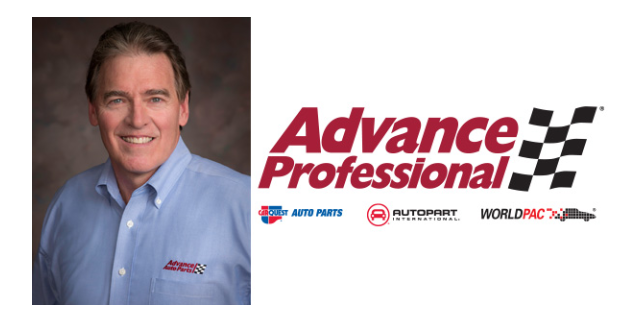 At WORLDPAC, and now at Advance, I view our business as a tech company that sells automotive parts and provides technical solutions to our customers. In 2017, our digital-transformation roadmap was developed to support “The Right Part at the Right Time,” and in 2018, we began to deploy our new technology. We – and more importantly, our customers – are excited about what we’re doing at Advance. At Advance Professional, we’re doing everything to continue to build stronger and stronger partnerships with our customers. In our banner program, TECHNET, we’ve enhanced the program and membership across all of our brands. The industry’s leading training programs – the WORLDPAC Training Institute (WTI) and the Carquest Technical Institute (CTI) – are now integrated to provide our entire enterprise-wide customer base a broader curriculum of classes. The WTI/CTI training program empowers our customers to meet the complexity of repairing today’s vehicles. With an industry-wide shortage of certified technicians, WTI/CTI is training our customer’s technicians on new technology such as ADAS and helping build career paths to attract and retain technicians. In 2018, we held our biennial WORLDPAC Supplier & Training Expo [STX], with more than 1,500 attendees. We’re already building our new curriculum for the STX 2020 event, including more than 150 classes, and we’re expecting more than 2,000 attendees. STX 2020 will be the largest training and supplier expo event in the automotive industry. CM: What does Advance Professional have planned for 2019? BC: We’ll continue to focus on our digital roadmap, focused on providing our customers the ability to access our complete suite of products, services and data. Over the past few years, we’ve spent a lot of time developing Virtual Vehicle, a cloud-based library of 3-D animations illustrating how each vehicle part and system works. Virtual Vehicle identifies what repair is needed when certain vehicle conditions exist. This enables our customer’s service advisers to explain, in simple terms, the repair work required to the car owner. What we’ve found in shops that use this tool is an increase in repeat business, more referrals and higher conversion rates. We’re relaunching Virtual Vehicle with an expanded assortment of new videos, including how to replace parts on specific vehicle models. We’re building further enhancements and benefits to our TECHNET banner program to improve the customer experience and drive new membership. We all know about the importance of access to vehicle data, for vehicle owners and repair shops. The Auto Care Association is doing a great job supporting legislation to provide access to the aftermarket. We are partnering with other industry leaders and supporters to provide additional access to the data. An important part of our customer-experience roadmap is building a more robust product assortment closer to the customer to improve availability and reduce order-to-delivery times. Our customers expect shorter times to drive higher bay turnover. To support this initiative, we’re building out a digital delivery system that includes real-time access to delivery times from our stores, branches, hubs and DC network. This will provide our team members and customers delivery-time estimates during the order process so they can make an informed decision. BC: The fundamentals look really strong. We’re looking forward to a terrific 2019, as we experienced in 2018. The industry will continue to grow and provide opportunities. Low unemployment, miles driven, low fuel prices, the average age of vehicles, improved “sweet spot” – all of those factors indicate a very positive, robust industry in 2019. We love the momentum we’ve experienced throughout 2018, and we see that momentum carrying through 2019. CM: What are some of the macroeconomic issues that could have an impact on your business in 2019? BC: Obviously, we’ll be watching the tariffs carefully. For the most part, I think the prior [round of tariffs]wasn’t an issue. The industry was growing and well-positioned to pass on the price adjustments. As I mentioned earlier, one of the greatest industry challenges is the technician shortage. We continue to focus a lot of time and energy into the CTI and the WTI. We’ve partnered with NASTF on developing a technician career path. We’ll continue to work with our strategic partners to develop that career path, to attract more high school students into this industry. We’re committed to helping the industry address this critical challenge. We have a feasibility study in progress to assess building an Automotive Institute of Science and Technology. More to come relating to this important initiative.